There are other Large number of Suthras in Each Veda.Some of them have been lost ..Some existing Suthras have followers in many pockets in North India. Among the Tamil Brahmins the maximum number are Followers of Krishna Yajur Veda , followed by Rig veda, followed by Sama Veda followed by Shukla Yajur veda. Majority of the Tamil Brahmins are either followers of Adhi Sankara or Saint Ramanuja. Though in Kumbhakonam there are few families following Madhvacharya , the number is meager . These Brahmins were settlers from Karnakata during the time of Krishna Deva Raya. The Followers of Adhi Sankara follow the philosophy of Advaitha and are worshippes of Lord Shiva, Lord Vishnu .Goddess Shakthi, Lord Subramanya and Lord Ganapathy . The Followers of Ramanuja called Vaishnavitee follow his philosophy of Visishttadwaitha and worship Lord Vishn and Goddess Lakshmi and all their incarnations. The Vast majority of Tamil Brahmins originate from Tamil Nadu but there are settlers from Andhra , Maharashtra and Karnataka who have been living with them for several centuaries .They are part of Tamil Nadu and follow the customs of their own. 5.The Pandi Brahmins of Kerala. Namaskaram mama! 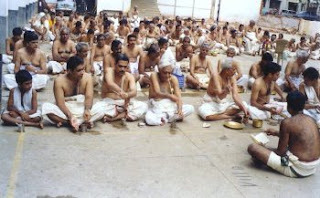 Shankotai Iyers are also there, known as Sankethi Iyer. There are other groups of Brahmins, by profession, Bhattachariyars/Gurukkal. They serve the deities in temples, but they are kept separate in matrimony. A similar situatuation for the prohits (in Tamil we call them 'Vathiyars). They guide the karthas doing pleasant/sorrow rituals. They are not mingling with the other subsects. This can be called 'untouchability' even among the brahmins. Now the children are educated and are in good jobs in MNC's. But prohitam suffers as there are not many boys interested in choosing 'prohitam' as a profession as it is not viable if not lucrative. But the write-up is informative and the author has spent time collecting data. Hope many would atleast read. Please also look my psot on Veda Union of Europe, the group chanting Sri Rudram at Prasanthi Nilayam. I agree with you.Partly the problem has been to ceratain extent solved in case of Vathiyars in cities as they have become very rich.The situation is extremely bad in case of Purohiths of villages and Vathiars in small villages,Unfortunate. DEar Raman, The great Jnana Sambandar is supposed to have won over religious arguments and drove them all away.There are some h jain monuments including temple near Kudumian Malai near Trichy.As far as I know there are know jain temples in Kerala.